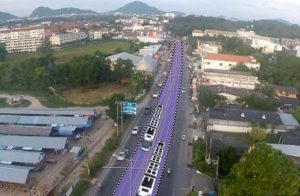 The Mass Rapid Transit Authority of Thailand (MRTA) is now inviting the private sector and local administrative bodies to get behind and invest in a mass-transit project in Phuket. The project is valued around 35 billion baht. The next rounds of talks and presentations are being held in Bangkok this Friday. 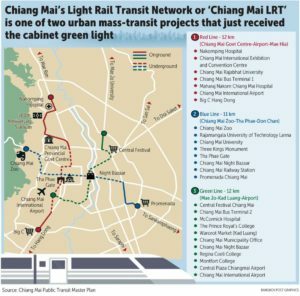 The main feature is a new 58.5 kilometre long light rail service valued at 34.8 billion baht. 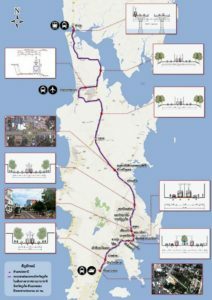 The tram route plans to run from Tha Noon in Phang Nga province, across Sarasin Bridge onto Phuket, past the airport, through Phuket Town on the east coast and then finishing at Chalong’s main intersection near the Chalong Circle. The Phuket tram project has been divided into two phases: a 41.7 kilometre section from Phuket airport to Chalong intersection and a second phase, a 16.8 kilometre stretch from Tha Noon in Phang Nga to Muang Mai at the north end of Phuket, linking to the first phase. The MRTA will contract the first phase which will have 21 stations. They expect to seek cabinet approval for the project in the middle of this year with construction likely to begin in 2020. They estimate it will be operational by 2023. At this stage, the MRTA says tram fares will be calculated based on the distance travelled but a maximum fare would not be more than be 100 – 137 baht. This would put the cost of daily use for many local Thais out of reach of their budgets (it costs about 80 baht to fill an average 110cc scooter which would last most of the week). Critics say the tram stops avoid most of the tourist hot spots along the west coast of the island and features on locals living along the main Thepkasattri truck route from Thalang to Phuket Town and then Chao Fah east to Chalong. They also don’t believe that Thai users are likely to give up their point-to-point motorcycle transport for a more inconvenient, and expensive, tram that will necessitate them using expensive taxis, buses and motorcycle taxis at either end to get them to their destinations. Critics also cite the three year construction period, which if following recent major road construction projects, is likely to blow out to four or five years and and the massive disruption of traffic during the construction time. They also believe the loss of road space along the route will restrict local road traffic even more, neutralising the nett gains of the new tram system. The island’s Governor says Phuket is experiencing rapid growth and that traffic is getting worse, adding that an efficient mass transit system, was urgently needed to accommodate tourists (without explaining how the new light rail/tram would actually assist tourists). 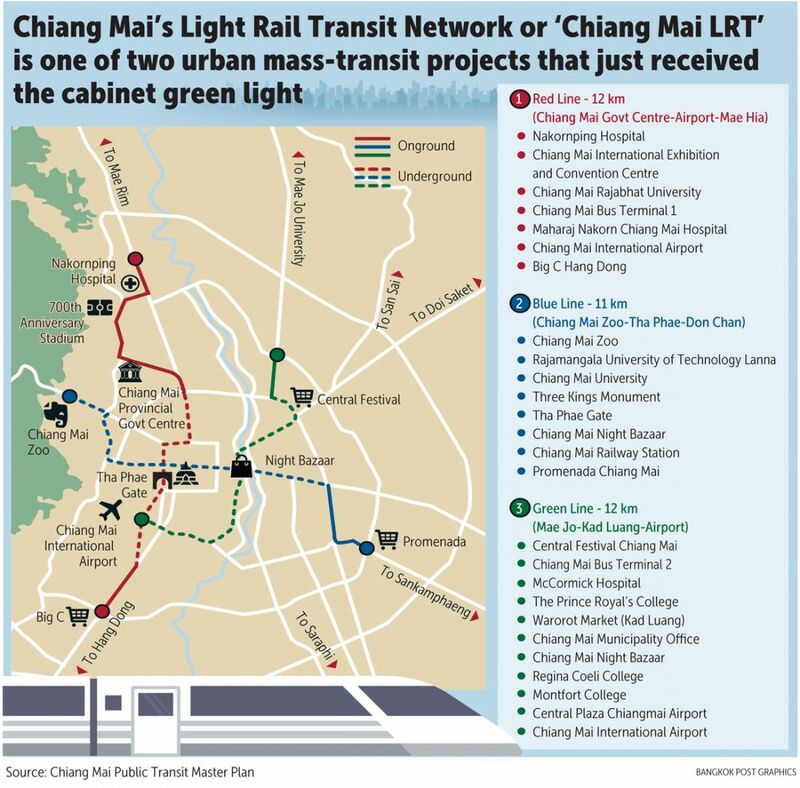 The MRTA is also working on a three-route tram project in Chiang Mai. The red line would be worth 30.4 billion baht and the 11.9 kilometre Green Line would have 10 stations worth 36.2 billion baht. The Blue Line will travel from the Chiang Mai Zoo to Tha Phae-Don Chan.